Exactly 800 years ago, and irrespective of the host of problems they were already battling with – ranging from predatory aristocrats to failing harvests – the prelates of medieval Christendom had to find time to absorb the content and think through the implications of a remarkable encyclical that arrived from Rome. This was Quia maior, which like all papal bulls took its name from its opening words. Quia maior is one of a small cluster of bulls which can be shown to have exercised an enormous impact on the contemporary world. Indeed, it’s not going too far to compare it to Alexander VI’s Inter caetera (1493), which in a show of blatant favouritism assigned most of the New World to Castile. The most immediate effect of Quia maior was to call into being the Fifth Crusade, in which countless thousands of Crusaders and Muslims met their deaths from combat, privation or disease in fighting which went on for years in the Nile Delta. Had it succeeded, the Fifth Crusade could well have given Christendom a definitive victory in the struggle for possession of the Holy Land, because the conquest of Egypt would have made possible the recovery of Jerusalem and the long term security of the crusader states. Its failure was a crushing setback which in the eyes of some historians initiated the decline of crusading fervour (a view from which I dissent). So the preaching of this bull had a profound effect on the lives of many, many contemporaries. But the significance of Quia maior goes even deeper than that. 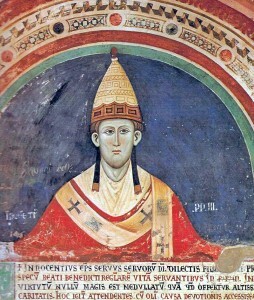 The bull’s author, Pope Innocent III, pulled together complex strands of thinking about the meaning and management of crusade that had been evolving since the time of the First Crusade. Aside from anything else, the encyclical includes a prayer which encapsulates in fewer than a hundred words the theology underpinning the practice of crusade. It’s a masterpiece of elegant compression, pinpointing the sacred synergy of providence, Christ’s death on the cross, the Christian claim to the Holy Land, and the vows made by Crusaders. And the bull set out with admirable clarity the terms of the fully developed crusading indulgence, by which a wide range of contributions towards the forthcoming expedition would earn Christians forgiveness of sins. As historians have noted, Quia maior marked a sea-change in the way crusading functioned. It democratised the practice of Crusade by enabling contemporaries to advance the work of the Church in a multitude of ways, of which setting out to fight in the east was just one. Moreover, the job of soliciting and collecting their various contributions was placed on the shoulders of the Church – hence the bull’s portentous significance to the high clergy of the day. We can assume that many of them would have been shocked by the responsibility, and the amount of work involved. In a sense the whole bureaucratic edifice of crusading in the late Middle Ages can be traced back to this single text dating from the spring of 1213. Two years after the issue of Quia maior the Fourth Lateran Council legislated comprehensively, on the crusade as on just about everything else that mattered to baptised Christians. Its crusading canon, Ad liberandam, built on the content of Quia maior and added to its aspirations to create a comprehensive crusading experience. Because it was part of the greatest package of legislation produced by the medieval Church, Ad liberandam has tended to overshadow Quia maior, which is unfortunate. 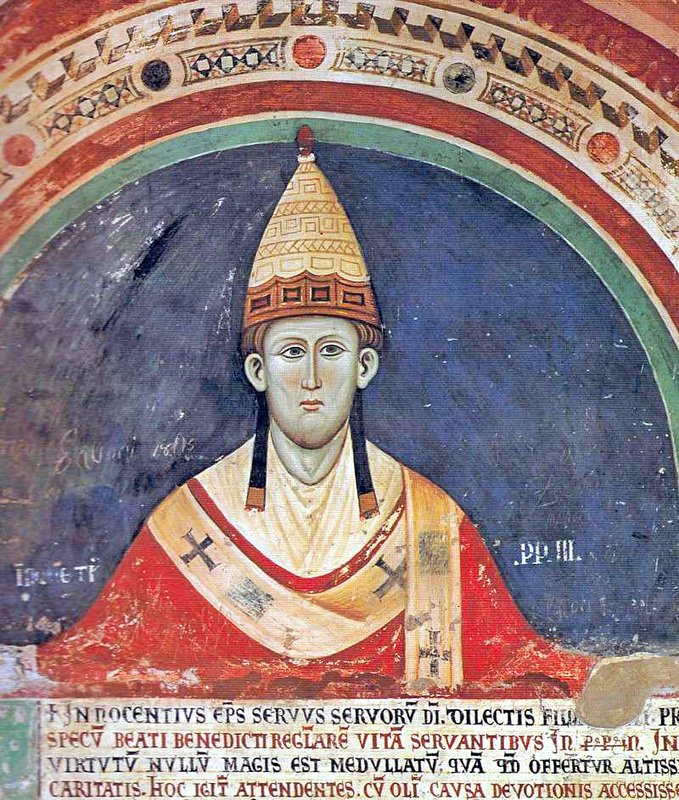 For Quia maior is a remarkable text in its own right, and arguably it takes us deeper into the mind and hopes of Innocent III, the greatest of all crusading popes, than any other surviving document. As Jonathan Riley-Smith put it, it is ‘the apogee of papal crusading propaganda’. Quia maior deserves to be remembered. Regrettably the text is not available online, but a translated version can be found in Louis and Jonathan Riley-Smith, eds, The Crusades: Idea and Reality, 1095-1274 (London: Edward Arnold, 1981), pp. 118-124. Dr Paul Rout OFM of Heythrop College, University of London, has written an account of the meeting in 1219 between Francis of Assisi and the Sultan of Egypt, al-Malik-al-Kamil, in Damietta, during the Fifth Crusade. I’ve been reading about the Fifth Crusade recently but had not appreciated the significance of the Quia maior in relation to it. In relation to the availability of that document is there a particular reason why it and others like it are not available online? Are there legal or other restrictions that would prevent such publication or is it simply a matter of someone “getting round to it”? Leave a Reply to Norman Housley Click here to cancel reply.